Filderstadt, 23.09.2015 – The German racing team ABT Schaeffler Audi Sport will start with a new electric race car in the season 2015/16 of the FIA Formula E. For the development of new components of the race car, four measurement modules and one data logger have been made available by CSM. The entire drive train along with the engine, gearbox, inverter and cooling, as well as the chassis, have been redesigned. “The FIA Formula E is an important stimulus for the development of more efficient engine and drive train concepts in the area of e-mobility. We are delighted to be able to support this development with our measurement technology”, emphasises Christoph Mühleis, Head of Product Management and Marketing at CSM GmbH. In the vehicle development, road test data is used to validate theoretically calculated measurement values thus ensuring the best possible design for the individual components and the vehicle as a whole. When developing its Formula E race car, ABT Schaeffler Audi Sport, mounted the CSM measurement modules directly to the traction battery of the vehicle for test bench tests and during test drives to carry out the required measurements. For optimizing the chassis, the mechanical stress on the push rods of the axle suspension has been measured with an STGMM strain gauge measurement module. Since cooling plays an important role for the energy efficiency of electric engines, a PTMM temperature measurement module has been used to optimize the cooling system of the drive train, and for measuring the temperature of the oil and the cooling water. The air resistance which for example depends on the height of a vehicle is another key element for energy efficiency. In order to keep the height as low as possible, several laser distance sensors have been connected to two CSM ADMM measurement modules to calculate the optimum distance between the vehicle floor to the road surface. “We are highly satisfied with the CSM measurement devices. Thanks to the ease of installation, we could always flexibly adapt the measurement setups to the measurement tasks and what's more, there were no failures in the modules, although they were exposed to high stresses. During the test drives the modules were exposed to acceleration forces of up to 5 g”, explains Jens Häberle, Technical Manager e-mobility at the ABT Sportsline GmbH. Launched in 2014, the FIA Formula E is the first Formula racing series in which exclusively electric vehicles are driven. In the first season of Formula E in 2014/15, all teams started with identical cars, in the current season 2015/16, the teams are free to re-design the entire drive train and the chassis. 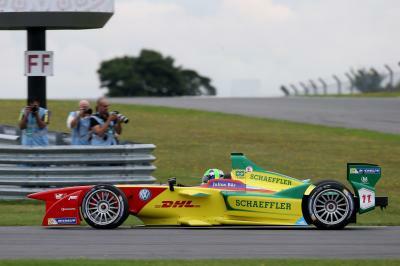 Ten teams each with two drivers will fight for the Formula E Championship in this season with ABT Schaeffler Audi Sport being the only German team in the field. Contrary to Formula 1, this competition does not take place on the usual motor sport racing tracks, but on ten temporary city circuits hosted by key cities around the world. The only race in Germany will be in Berlin in May 2016, on the premises of the former airport Berlin-Tempelhof.